Moms, we hear it all the time, don’t we? The question that can make us sigh and roll our eyes or want to hide in a corner. We don’t know the answer today and we know we won’t have the answer tomorrow. If your house is anything like mine, the questions start around 10AM- right after they’ve had breakfast and a snack. I love and encourage curious minds, but seriously? And that is just one reason meal planning has saved my sanity. 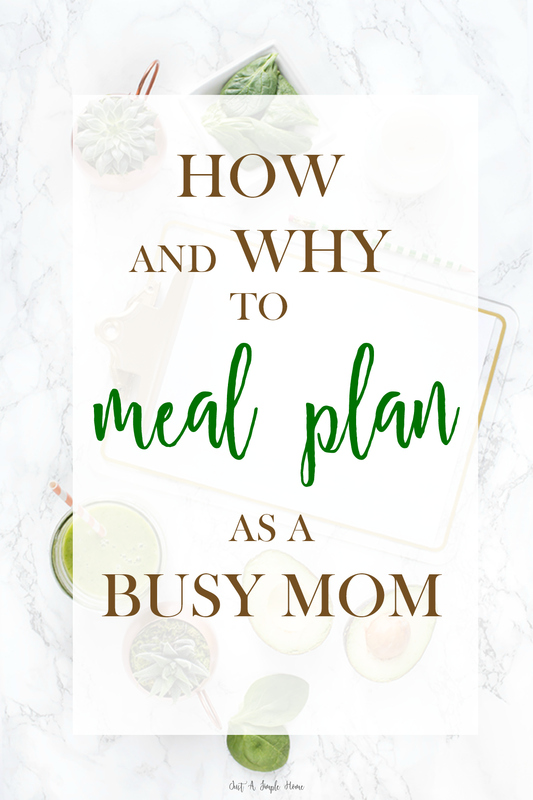 I know we have all heard it before…the key to organization for busy moms is MEAL PLANNING. We have heard it so many times that our brain tends to get fuzzy and our eyes glaze over when someone like me tells you to do it. I understand. The thought of planning yet another thing is daunting, but I promise you that NOT planning is costing you a whole lot of time, money and energy. Meal planning doesn’t have to be difficult and it doesn’t have to take a lot of time. Anyone can do it and can do it in a short amount of time and reap the benefits. Whether you can’t stand cooking or it’s your favorite thing in the world, you can and should still meal plan. Meal planning is simply the act of scheduling and/or prepping your meals ahead of time to save you the exhaustion of going through the “What’s for dinner?” every night. I am a mom of six, soon to be seven, and meal planning quite simply saves my sanity. On weeks when I have let it slide, I find myself stressed and disorganized, especially during the busy seasons of life when we have activities and newborns and whatever else. Many moms I talk to don’t meal plan because they don’t know where to begin. I’m going to break it down into simple steps to show you how I have meal planned for my family. Make a master list of meals or recipes you normally use and enjoy. Every home has their go-to recipes that show up week after week. Taco Tuesdays, breakfast for dinner, pizza night, Italian night, etc. Add those meals to your master list. Involve your husband and your children and get their opinions on what meals they want to see on the meal schedule. At this point, you are only making one big list, so don’t worry about when and how you will actually make these meals. You are just keeping a master running list of meals your family enjoys. Now that you have all your tried and true recipes on your master list, you will want some variety. Don’t go crazy here, because you will get overwhelmed and give up. But take a few minutes and browse any recipe books you have or search on Pinterest for some new recipes you’d like to try. Remember to gather a wide variety of recipes – meats, side dishes, crock pot meas, soups, casseroles etc. You can now add these meals to your master list or keep a separate list of meals you want to try. Either way, be sure to take note of where you got the recipe from so you can reference it quickly when you need it. Decide how far in advance you want to meal plan. This will vary from family to family. I have tried meal planning for a month at a time, and while I loved the idea of it, it just wasn’t realistic for me. I also have found that meal planning for one week at a time isn’t enough for my sanity level right now, but it has worked very well in the past. I am now meal planning for 2 weeks at a time and I find it is just what I need at this stage. If you’re new to this whole meal planning idea, start with a week and see how it goes. Even planning your meals for a week in advance is going to save you so much time and stress as a mom. As you get used to meal planning, you can plan out much further. Meal planning isn’t just about taking the stress off you, but about creating routine and predictability for your family. When my kids can see what is for dinner each time, they are less likely to ask for something different and I actually get less complaints because they know exactly what to expect. Get out your calendar and take a look at the schedule. This is it! The actual meal planning part. You now have a master list of old and new meals and you have decided how far in advance you will meal plan. Now you need to get it down on an actual schedule. Your family’s schedule will dictate which meals you plan for what night. When are your activities planned? Do you have get togethers to attend? Is there a holiday coming up? When are the kids needing to be taken to sports or school activities? Do you have meetings? For busy evenings, plan quick meals. Sandwiches, soups, salads. A crock pot meal works wonderfully for nights you won’t have time to cook. I often put a meal in the crock pot in the morning and am so thankful when I remember I don’t have to do anything later on. Plan homemade meals for days with less activity. If you have the time, use those days for big meals that take up more time. At this point, we do have a few days a week that we are home bound. I save the bigger meals for those days, since I have more time. Another helpful tip I have learned: when I am making the bigger meals, I tend to make double and freeze half of it. This saves me from making a home cooked meal at a later date. When I’m making my master list for another week, I can look in my freezer and see what meals I already have made. Prep freezer meals and casseroles for emergencies or last minute changes. We all know that the best laid plans don’t always work out. Things come up when we least expect them and it is wonderful to have a few meals prepped at all times, frozen and ready to be cooked when needed. Casseroles and Crock Pot meals are perfect for this situation. They can be easily thawed or thrown in the oven or crock pot. Write down which meals you will have on which days/nights. You now have your meal plan and all you need to do is shop and prep! I created a FREE Weekly Meal Plan printable for you to use if you wish. Just download and save and you can print a new one each week! Before you go anywhere or buy anything, take a look at what you need for each meal. You should have written down where to find each recipe on your master list, so pull that out and see what ingredients you need. Take inventory of what you have on hand for each recipe and what you need to add to your shopping list. Do you have all the condiments, spices and herbs that you’ll need? Do you already have a few pounds of chicken breasts in the freezer? This is all about saving time and money, so you don’t want to come home with ingredients that you already have. The key here is to make one trip for all of your ingredients. Going to the store multiple times throughout the week not only cuts into your schedule and wastes time, it cuts into your budget. I do my shopping for two weeks at a time and I go with a budget. If I am going to the store multiple times in a week, it is amazing how quickly my allotted budget seems to disappear! You’ve planned and shopped…Now, let’s prep. You did the planning, you did the shopping. So, now what? Now, we do some prep, because a plan is only as good as the preparation you do before it. I will say you do not have to meal prep, but I highly suggest it. Again, this is all about saving you time. Divide up meats into your meal portions and freeze. Decide how much meat each meal calls for and divide it up accordingly. I also cut up my chicken, depending on the meal I’m planning. Some meals call for strips, some call for cubes and so on. Likewise, cook any meat that needs browning, such as ground beef, turkey or chicken. Now, chop your veggies and fruits, if needed. Just like with the meat, the more you get done ahead of time, the less you will need to do on those busy weeknights. I find that when I cut up veggies and fruits and make them available to my kids, they are less whiny and they tend to eat more veggies. See if you can use your chopped veggies for more than one meal, and save time in the future. Put together all of your casseroles or frozen meals. Be sure to label them properly with the meal name and date. I know you are likely only planning for a week at a time, but this will come in handy when you plan further out down the road. You’ll get there! NOW… You’re a meal planner! You did it! You’ve planned, you’ve prepped and now all you need to do is cook the meal when the time comes. The best part is…you know exactly when that time is coming! Remember, this isn’t supposed to be a chore. It may seem like it at first, but it will become second nature. Cooking and providing delicious and nutritious meals for your family is wonderful and the planning takes the stress out of the constant starting over every day. I even get my kids involved in some way. Some kids can chop veggies and I am training my two oldest children to cook some simple meals. We put some music on and dance away as we prep! So, the next time your kids ask, “What’s for dinner?”, point them to where you hang your meal plan…and I bet you won’t even have to say a word. Awesome post! meal planning is so important. Love your tips as I need to get better a it! yessss!! i love to meal plan. it helps with budget and time! i meal plan for our families dinners before i go grocery shopping and i also meal plan for myself as an aid in weight loss. i make my lunches of chicken and veggies so when I’m starving i just eat whatever is fastest. i love having everything for dinners for the week ready to go too! thanks for this post you put a lot of time into this one! This is so good. I’ve been wanting to meal plan for a while and I’ve tried but it never works out. I’m always overwhelmed with where to start and how to even get the ball rolling. Thank you! I try to meal plan because it definitely makes the week easier and keeps our grocery list down! It is a lot of work upfront but I think saves time during the week. I’ve tried (and failed) at meal planning before, but I feel like your post and printable have FINALLY prepared me for success this time around! Thank you so much for the advice! Meal planning has been a HUGE help for me! It definitely took some time for my family to get used to. I think they were a little resistant to the structure but can see the benefits! Plus, it saves money! I love it! And it helps me to not feel like I am in a rut with dinner. I haven’t tried meal planning yet but I hope to implement it soon. I loved your tips, breaking it down with looking at the upcoming week and figuring out how much time I will have to cook is going to be key for me. The shopping and prepping is the easy part (at least in my opinion). I have not tried meal planning yet, and now that I see this post I realise the benefits. Like saving and eating healthier. Thank you for this. Meal planning has changed my life! My afternoons and evenings are so much easier when I don’t have to worry about figuring out what’s for dinner. I also have a menu board so everyone in the family can see what’s for dinner all week, and they don’t have to ask me a million times what’s for dinner! As much of a “no-brainer” as it may seem, I needed to hear what you said about planning more involved meals on nights when you have the time and simpler meals on busy nights. For some reason, I never seem to go the extra mile and match my meals to my calendar to see how my calendar matches up with my meals. Honestly, this little ah-ha moment can help cut out a lot of unnecessary stress. Thanks! If I don’t meal plan, my family ends up eating cereal for dinner! These are great tips, thanks!! It took me a while before I had made it into a habit, but yes, for me it really works to plan my meals ahead, at least for three to four days. Unfortunately my freezer isn’t large enough to store a lot of food and prepared meals, so I have to buy fresh vegetables and meat at least once a week. Thanks for your suggestions! Thank you for this! I have been trying for a while to become a meal planning momma. I love the idea of a master list! This is great advice. It is so easy to have good intentions, then get thrown off track. This is a habit I need to get into! Meal planning would take so much pressure off ofme when I get home. This post was a huge eye opener on an easier way to live. Meal planning is definitely a goal I have for the near future! Although it’s just my husband and I, I think planning ahead will help with eating healthy and having more variety. Thanks for all the great tips! I’m not a busy mom (yet), but my husband and I are busy. These are some great tips! Ooh I need to do this! It looks like it would save me a ton of grief! This is a great post. Meal planning saves us so much money and time. Personally, it saves me lots of stress when I already know what I’m cooking rather than scrambling in the afternoons. Meal planning is so important for my home. Otherwise, it’s so easy for us to go out to eat and spend money we don’t need to. I’ve been prepping some crockpot freezer meals and buying easy frozen items to prepare for life with a newborn. I meal plan based on what is in my pantry/freezer each week, and then my grocery list is usually very short. Wow! That’s so smart. I had never thought to brown my meat ahead of time and then just quickly reheat it the night we want to eat it. I’m a long long time meal planner. I can’t imagine starting a week without having the menu planned. Meal planning is a constant struggle over here. Our son has sensory issues and autism, so we tend to end up having one meal for us, and a supplementary meal for him. He still has to try our food, but we are a long way off from having one meal as a family. Unless its macaroni and cheese with yellow cheese. Or hotdogs. Sigh. Thanks for the great tips! These are great tips! We are getting ready to move, but I fully intend to start meal planning once we are settled in. Meal planning saves my family so much money! With three teenagers, I often have one or two working at night or they have a plus one for dinner. I always make a lot and my youngest teenager eats it before bed or for breakfast. This is so great! I really need to start meal planning and you gave me some great tips! Love your take on meal planning! It has been a game changer for me and I’m so glad we started soon after we got married! I know it has saved us so much time & money – but also stressed like you mentioned! When I don’t meal plan, I find I spend way more time figuring out our meals.